I'm not much of one for surprise parties. I find that I love the excitement almost as much as the actual event, so I'm always better off having something to look forward to (although I do still love surprises). I do, however, love planning surprises! This is why I was so jazzed to pull off my parents 35th anniversary without them actually finding out! My siblings and I put our heads together and decided to use the top floor of a wine tasting company in our awesome downtown. It has a rustic flair and free as long as you don't mind people milling about! Since none of us is super well-off, we had to go about this a bit thriftily, but I think it worked well, since the place had an eclectic vibe on its own. I used a bunch of frames from home and placed in photos from their wedding around the place (and a few recent ones). I also made a sign with some things I had around the house- twine, cardboard and paint- with a few photos through the years. The only thing they knew was that my hubs and I were picking them up for wine and cheese to celebrate their anniversary, but when we got there, they were definitely surprised! And we definitely made them cut the cake! Now, this all was pretty simple to do and to keep secret, but the best part was opening gifts. For the last few months, I have been monitoring a secret Facebook page and messaging all of my parents Facebook friends, even making a few long distance phone calls to those I couldn't find online. I had been asking people to write letters to my parents to tell them how their marriage has made an impact in their lives. I ended up receiving somewhere around 70 letters. Unbelievably- no one told them! We even received a beautiful gift for them from Natalie at Apple Valley Natural Soaps! They LOVED it! And while I was so nervous things wouldn't go smoothly- it was absolutely perfect. They had a wonderful time and were so happy to have the whole family together to celebrate their 35 years of bliss- which sounds like a cliche until you've gotten to know them. :) Their marriage has been the most incredible example of godly love and selflessness. I have seen them be incredible parents, an amazing husband and wife team, and completely dedicated to Christ. Now, I get to see them be incredible grandparents as well! Dad and mom, thank you for being such beautiful examples of marriage in my life! I truly hope the letters from everyone show you how much your lives make a difference. And thank you to everyone who wrote letters! I loved reading them!! I wish I had been able to post about this sooner, but it has been a whirlwind of a week and I'm sure it will continue to get more and more busy as warmer weather comes. :) I've been in Heaven spending a few afternoons on our porch reading in the sunshine and listening to the birds. I'm pretty sure God created seasons for people like me. Bright and Cheery Spring Door Hanger! I LOVE this time of year! The bright green sprouts on trees, the occasional sunshine-warmed day hitting the high 70's... it rejuvenates my very soul. I feel like it is God's way of giving us hope after such a long and cold winter. It means skirts and dresses, reading books in the sun, running and biking outdoors, and busting out the motorcycles. And now that we have a beautiful new front door, I had to hang up my lovely DIY door-hanger to let our neighbors know just how crazy we are about the warmer weather! I love the festive look of this hanger! The colors are so fun and it screams SPRING to me! The best part is that you can make them whatever colors you want! Just get some thin wooden letters and paint them to your liking! If you don't have a storm door to protect it, you should spray a protective coating over the letters! I drilled a small hole (or two) at the top and bottom of each letter and used some colorful thing crafting wire to tie them all together. Just make a wire loop at the top and it's all done! They are so thin and light that it has no strain on the door. Such a fun and easy way to brighten up the front door! I can hardly wait until the weather is more consistent and we get some of those warm thunderstorms. :) It gives me warm fuzzies just thinking about it! April Fool's Day... The nice way! I'll admit- I've never been much of a prankster. My poker face is non-existent and my conscience is too strong to pull a mean prank. This leaves me with few options for April Fools' Day! 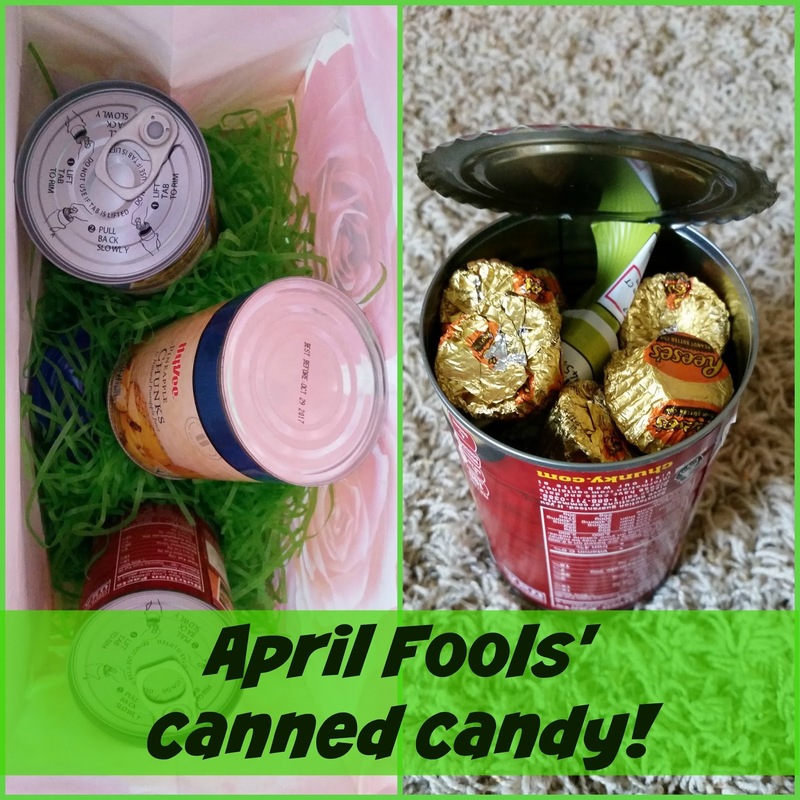 I love to be festive, but I usually end up skipping any pranks as I admit defeat. Just a few cans of soup and some chunky pineapple. Not the greatest road trip snack. 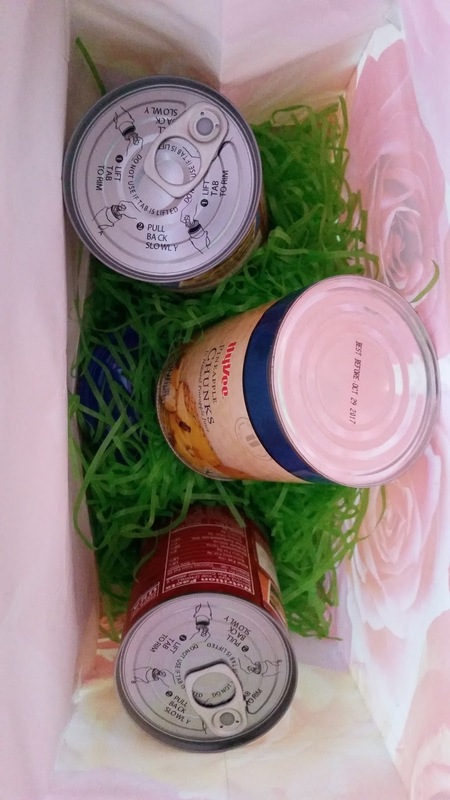 Fortunately, with very little time-involvement, I was able to stuff them all with treats! This was a quick and easy trick. First, find a few cans in your pantry (or buy a few in particularly nasty canned items), and make sure they have a lip around the bottom just like the top, where a can opener can grip it. 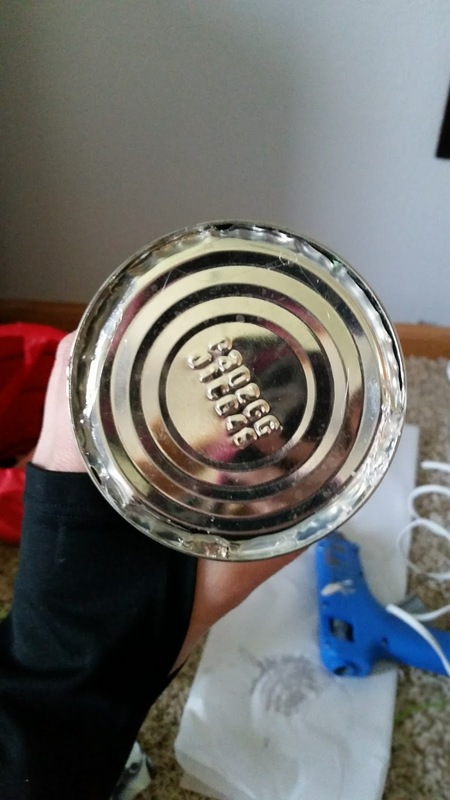 Open the bottom of the can ALMOST all the way. You could go the whole way, but this is much easier! Dump out the contents into a storage container to eat later and thoroughly clean out the cans, then dry them. Pick out treats that work for the individual. For instance, I picked mini peanut butter cups, Star Wars fruit snacks, pistachio pouches, mixed nut pouches and coffee-infused chocolate discs. 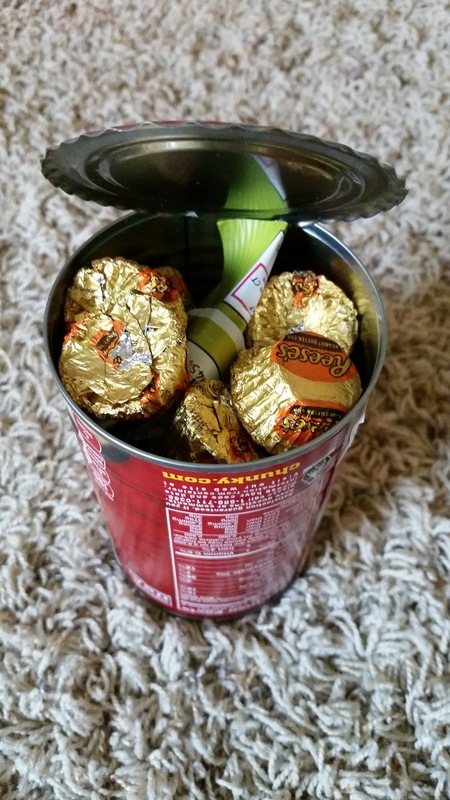 Just whatever individually-wrapped snacks will fit in the cans! Then close the bottom of the can again and hot glue it shut. Try to keep the glue neat and to a minimum so it doesn't attract too much attention. Then you're done! 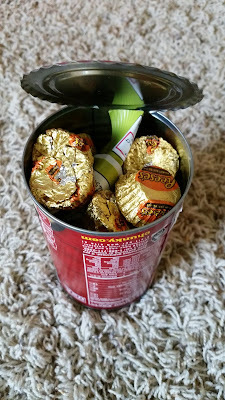 Package them in a non-conspicuous way and if you're anything like me, have them open it when you're not in sight! Any fun pranks you've pulled or fun ideas for future years? Let me know! Feel free to try this and let me know how it turns out!